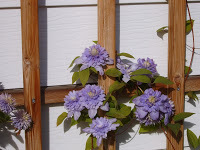 Here are pictures of flowers at Camai Bed and Breakfast that I took earlier this week when it was sunny. 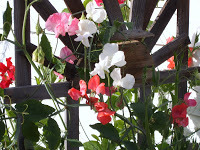 The sweet peas are fragrantly growing next to our garage while the clematis is growing up the trellis behind our peony bed. I took the pictures since every morning feels more like fall. I want to remember the summer flowers during the short days of January when the brilliant white of the snow seems as if it will remain. Under the snow will be my “sleeping” perennials…the peonies, clematis, and roses, to name a few.